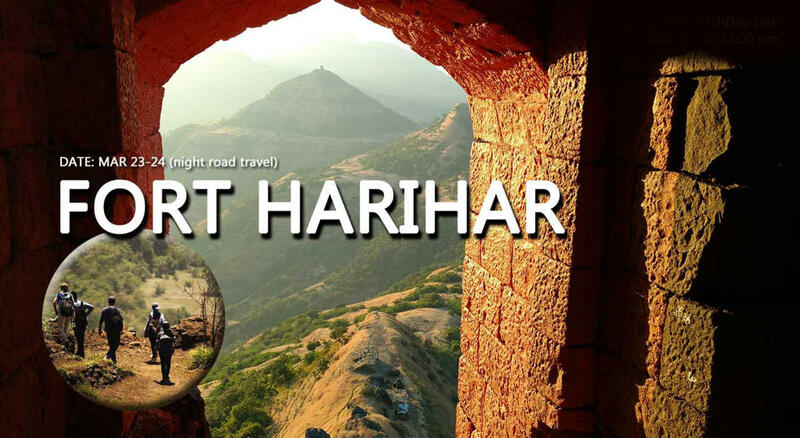 At a distance of 260 km from Pune and 45 km from Nashik, Harihar Fort or Harihargad is a small hill fort in Upper Vaitarana range near Trimbak in Nashik district of Maharashtra. Harish Fort was one of the forts in the possession of the Ahmadnagar Sultans. In 1636 CE, Harishgad, Trimbakgad, Tringalwadi and few other forts were given by Shahaji to the Mughals. Harishgad was one of the 17 strong places that surrendered to the British on the fall of Trimbak in 1818 CE. It is an important fort in Nashik district, and was constructed to look upon the trade route through Gonda Ghat. Built on a triangular prism of rock. It’s three faces and two edges are absolutely vertical 90 degrees. The edges of this stunning fort is absolutely vertical, further adding to the uniqueness of this stunning ancient fort. Rock carved staircases lead you to the fort! Delight in the ancient beauty of thisfort while trekking through picturesque landscapes accompanying you throughout your HariharFort trekking. 05:30 – 06:00 am Freshen up and have breakfast. 07:00 – 12:00 pm explore the fort trekking through Trimbekeshwar Forest. Witness the stunning landscape after climbing rock cut steps (In an 80 degree incline). Explore the remains of the fort and return to base. • Package drinking water throughout the trip. Its summer season but we have a night journey so carry a light jacket for mild cold temperatures. Please wear non-bulky full body clothing preferably light colour (to avoid the high intensity of the sun). Please take care that you are responsible for all your belongings. Anyone found under the influence of drugs or narcotics will be requested to leave the trip immediately, without any refund. Adventure camping and outdoor sports/ recreation are purely for nature lovers and not for party groups; we respect nature and do our best to spread the awareness about wilderness preservation. We like to keep the wildlife wild, please do not litter the forest/ sanctuary and the campsite.